Johann Sebastian Bach originally wrote the Goldberg Variations for two-manual harpsichord, and it was one of very few works by Bach that were published during the composer’s lifetime, by the firm of Balthasar Schmid at Nuremberg in about 1741. The original title page describes the work as ‘Clavier-Übung [Keyboard Practice], consisting of an Aria, with diverse variations for harpsichord with two manuals, prepared to delight the souls of music-lovers by Johann Sebastian Bach’. There was no irony in the notion—expressed on this title page—of a work that aspired to speak to the soul of those playing and hearing the work: Bach, as a devout Lutheran, was deeply conscious of the spiritual dimension of music, and the wish of composers to enrich the soul as well as to divert and entertain. But the work was also an extraordinary feat of large-scale composition: if the Preludes and Fugues of the Well-Tempered Clavier are counted as self-contained pairs of works, then the Goldberg Variations constitute the most extended single piece of keyboard music published in the eighteenth century, and attracted some international attention early on. Bach is often thought of as a composer whose music was rediscovered only in the nineteenth century (thanks in large part to Mendelssohn and Schumann), but his keyboard music was something of an exception to this, even outside Germany, and the Goldberg Variations were particularly valued, though seldom played at the time. In his pioneering General History of the Science and Practice of Music, published in 1776, Sir John Hawkins devotes several pages to Bach, thanking Johann Christian Bach (who had settled in London in the 1760s) for supplying some of the information in Hawkins’s account of Bach’s life. 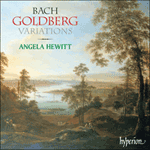 Hawkins concludes his discussion of Bach with three full pages of music examples, comprising the Aria, Variation 9 and Variation 10 from the Goldberg Variations, making this one of the first pieces of Bach to appear in print outside Germany. It is relatively unusual to find Bach being so precise in one of his keyboard works about the instrumentation: a two-manual harpsichord is specified for the Goldberg Variations, while most of his keyboard music is composed for an unspecified ‘clavier’ (keyboard). But there is a clear element of virtuoso display in Bach’s writing here, providing ample opportunity not only for the player to demonstrate agility as well as expressive range, but also for the instrument itself to shine. [The Count] often stopped in Leipzig and brought there with him … Goldberg, in order to have him given musical instruction by Bach. The Count was often ill and had sleepless nights. On these occasions, Goldberg had to spend the night in an adjoining room so that he could play something to him during this sleeplessness. The Count remarked to Bach that he would like to have a few pieces for his musician Goldberg, pieces so gentle and somewhat merry in character that the Count could be cheered up by them during his sleepless nights. Bach thought he could best fulfil this wish with some variations … The Count henceforth referred to them only as his variations. He could not get enough of them, and for a long time, whenever sleepless nights came, he would say, Dear Goldberg, do play me one of my variations. Bach was perhaps never rewarded so well for one of his compositions. The Count bestowed on him a gold beaker filled with one hundred Louis d’or. It’s a fine tale—and the source for the famous legend of these variations as a cure for insomnia—but it seems that like most good stories it is also the result of some embellishment. Goldberg was born in Danzig in 1727, and was thus only in his early teens at the time of Bach’s visit to Keyserlingk, so it’s wildly improbable that Bach wrote the variations for him to play. Moreover, they had almost certainly been published just before Bach’s meeting with Keyserlingk, so the chances are that he presented the Count with a copy having been asked about the possibility of composing some suitable music. This also helps to explain the absence of either the Count’s name or Goldberg’s on the title page of the first edition. Moreover, the Aria that is the basis for these variations is found in Anna Magdalena’s Notebook, most of which was compiled years earlier (although Christoph Wolff has suggested that the Aria was added by Anna Magdalena on blank pages in about 1740). Peter Williams has speculated that the player Bach most probably had in mind for the variations was his son Wilhelm Friedemann, a brilliant performer who had worked as organist of the Sophienkirche in Dresden since 1733. Still, Goldberg is reputed to have been a brilliantly talented young musician, and a pupil of both Johann Sebastian and Wilhelm Friedemann Bach. 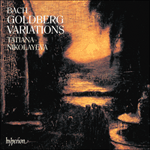 His compositions include a number of cantatas as well as keyboard works (though Forkel notes that while his playing was brilliant, Goldberg’s own music was less distinguished) and it is possible that Bach could have given the young Goldberg the theme to play. (This is one of the more plausible suggestions in the charming but largely fictitious Little Chronicle of Anna Magdalena Bach by Esther Meynell, first published in 1925.) Sadly, Goldberg’s career was cut short by tuberculosis, and he died in 1756 a few weeks after his twenty-ninth birthday. The variations constitute a virtual encyclopaedia of what was possible in terms of imaginative harpsichord writing, and the piece is even more remarkable for Bach’s brilliant manipulation of the theme—the theme and every variation are in two halves of sixteen bars each, usually divided into two-bar phrases, yet Bach avoids any sense of fearful symmetry, let alone monotony. As a master of transcribing his own music for different instrumental combinations, the arrangement of the Goldberg Variations by Dmitry Sitkovetsky for string trio is an idea that would surely have appealed to the composer. Just as Mozart arranged some of the keyboard fugues from the ‘48’ for string quartet, and others have arranged The Art of Fugue for the same forces, so Sitkovetsky has taken up the challenge of re-thinking Bach’s music for entirely different instruments—as Bach himself had done not only with his own music but also with other composers such as Vivaldi, Telemann, Marcello and Torelli. Sitkovetsky’s arrangement was made in 1985 to celebrate the 300th anniversary of Bach’s birth, and it is dedicated to the memory of Glenn Gould, whose celebrated 1955 Columbia recording of the Goldberg Variations became an instant best-seller and introduced a whole generation to this extraordinary music—a success that was virtually repeated in 1981 when Gould made a new recording that takes a less ebullient, more considered view of the work. Donald Tovey wrote that: ‘Until Beethoven wrote the Waldstein Sonata, the Goldberg Variations were the most brilliant piece of sheer instrumental display extant. No other work by Bach himself, or by Domenico Scarlatti, not even any earlier work of Beethoven could compare with it for instrumental brilliance.’ Given that part of that brilliance noted by Tovey comes from Bach’s writing for the harpsichord, it is curious that these variations first achieved worldwide fame in Gould’s version played on the piano, rather than the instrument specified by Bach. There are numerous arrangements of the Goldberg Variations for different instrumental combinations including those for two pianos by Joseph Rheinberger (revised by Max Reger), for woodwind quartet by Andrei Eshpai, for organ by Jean Guillou, and for solo guitar by József Eötvös, as well as the more drastically altered arrangement by Ferruccio Busoni (cutting out ten of the variations and adding a coda of Busoni’s own), a version for jazz trio by Jacques Loussier and the brilliantly re-imagined Gilded Goldbergs by Robin Holloway (recorded by The Micallef-Inanga Piano Duo on Hyperion CDA67360). Sitkovetsky’s choice of string trio produces some fascinating results. With three instruments of broadly similar timbre, the contrapuntal and imitative lines come across with great transparency, especially in the canonic variations Nos 6, 9, 12, 15, 18, 21, 24 and 27, or in the fughetta (variation 10) and the closely argued counterpoint of variation 22, or, finally, in the triumphant imitation (based on folk tunes) of the Quodlibet that forms variation 30. Some ingenious reworking aims to produce an equivalent of the virtuosity required on the harpsichord: the playful energy of variation 3 puts continuous motion in semiquavers on the viola that are topped and tailed by violin and cello. In variation 5, Sitkovetsky resists the temptation to write a third part, while the two-part texture of variation 6 is cleverly redistributed between the three instruments—leaving it as a two-voice jig—as it is in variation 11. The elaborate hand-crossing and figuration of variation 14 are imaginatively re-conceived as a dialogue between the three string players. The almost orchestral variation 16, a kind of miniature French Overture, is particularly well suited to the rich sonorority of Sitkovetsky’s instrumentation. The use of pizzicato for the running semiquavers in variation 19 may cause some surprise, but it provides an attractive change of texture. The highly chromatic writing of variation 25 works well on string instruments, with the greater sustaining power of strings allowing dissonances to be relished to the full. The frenetic momentum of variation 26 is, again, cleverly redistributed among the trio, while in variation 28 there is more effective use of pizzicato, perhaps to mirror the sound of the harpsichord as well as to lighten the texture. The grand chords of variation 29 are also persuasively transcribed. 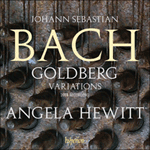 Overall, the character of the music is altered in quite a subtle way from Bach’s original: one obvious difference is that the musical dialogue now emerges as real chamber music, and while this wasn’t what Bach had in mind when he wrote the Goldberg Variations, it certainly produces an exciting way of hearing the work anew. Écrites pour clavecin à deux manuels, les Variations Goldberg furent parmi les très rares œuvres publiées du vivant de Johann Sebastian Bach—vers 1741, par la maison de Balthasar Schmid, à Nuremberg. La page de titre originale les décrit comme une «Clavier-Übung [exercice de clavier] constituée d’une aria avec diverses variations pour le clavecin à deux manuels, préparée pour ravir l’âme des mélomanes par Johann Sebastian Bach». Cette volonté de parler à l’âme des instrumentistes et des auditeurs n’avait rien d’ironique: Bach, luthérien dévot, était profondément conscient de la dimension spirituelle de la musique et du désir des compositeurs d’allier enrichissement de l’âme et divertissement. Mais cette œuvre fut aussi une extraordinaire prouesse de composition à grande échelle: si les Préludes et Fugues du Clavier bien tempéré sont considérés comme des diptyques autonomes, les Variations Goldberg constituent la plus vaste composition pour clavier publiée au XVIIIe siècle et, très tôt, elles attirèrent l’attention des autres nations. Bach est souvent regardé comme un compositeur redécouvert au XIXe siècle (grâce, surtout, à Mendelssohn et à Schumann), mais son œuvre pour clavier fit un peu exception, même en dehors de l’Allemagne, et ses Variations Goldberg demeurèrent fort prisées, quoique rarement jouées à l’époque. Dans sa novatrice General History of the Science and Practice of Music, parue en 1776, Sir John Hawkins consacre plusieurs pages à Bach, remerciant Johann Christian Bach (qui s’était installé à Londres dans les années 1760) pour ses informations et terminant son évocation sur trois pleines pages d’exemples musicaux où figurent l’Aria, la Variation 9 et la Variation 10 des Variations Goldberg, ce qui en fit l’une des premières pages bachiennes imprimées hors d’Allemagne. Concernant l’instrumentation, il est assez rare que Bach se montre aussi précis dans une œuvre pour clavier: un clavecin à deux manuels est spécifié alors que, la plupart du temps, le «clavier» ne l’est pas. Mais l’écriture de Bach présente ici un évident caractère de démonstration virtuose qui donne largement l’occasion et à l’interprète de montrer agilité et palette expressive, et à l’instrument de briller. [Le comte] faisait souvent halte à Leipzig et il y amenait … Goldberg, pour que Bach lui donnât une instruction musicale. Le comte était souvent malade et souffrait d’insomnie. Dans ces moments-là, Goldberg devait passer la nuit dans une chambre attenante, de manière à pouvoir lui jouer quelque chose pendant ces insomnies. Le comte fit savoir à Bach qu’il aimerait avoir quelques pièces pour son musicien Goldberg, des pièces au caractère si doux, un peu enjoué, qu’elles pussent l’égayer dans ses nuits sans sommeil. Bach pensa que le mieux à même de satisfaire ce souhait serait quelques variations … Dès lors, le comte ne les appela que ses variations. Il ne s’en lassa jamais et, pendant longtemps, à chaque nuit d’insomnie, il dit, cher Goldberg, joue-moi une de mes variations. Jamais, peut-être, Bach ne fut autant récompensé pour une composition. Le comte lui accorda une coupe en or remplie de cent louis d’or. C’est une bien belle histoire—à l’origine de la fameuse légende des variations capables de soigner l’insomnie—mais, comme très souvent, il semble qu’elle ait été un peu enjolivée. Car Goldberg, né à Dantzig en 1727, n’était encore qu’un adolescent au moment de la visite de Bach à Keyserlingk et il est complètement improbable que les variations aient été écrites à son intention. Par ailleurs, leur publication fut très certainement un peu antérieure à la rencontre avec le comte et il est fort probable que Bach, interrogé par ce dernier sur une musique à même de lui convenir, lui en ait offert un exemplaire. Ce qui concourt aussi à expliquer pourquoi ni le nom du comte, ni celui de Goldberg ne figurent sur la page de titre de l’édition princeps. En outre, l’Aria fondatrice de ces variations se trouve dans le Cahier d’Anna Magdalena compilé, pour l’essentiel, des années auparavant (encore que, à en croire Christoph Wolff, Anna Magdalena aurait pu l’ajouter sur les pages vierges, vers 1740). Selon Peter Williams, Bach aurait très probablement rédigé ses variations en pensant à son fils Wilhelm Friedemann, brillant interprète qui avait été nommé organiste à la Sophienkirche de Dresde en 1733. Reste que Goldberg passe pour avoir été un jeune musicien remarquablement talentueux, élève de Johann Sebastian et de Wilhelm Friedemann Bach. On lui doit plusieurs cantates et des œuvres pour clavier (mais, remarque Forkel, sa musique n’avait pas la distinction de son jeu brillant) et il se peut que Bach lui ait donné le thème à jouer, dans sa jeunesse. (C’est là une des hypothèses les plus plausibles de la charmante, mais largement fictive, Petite chronique d’Anna Magdalena Bach d’Esther Meynell, parue en 1925.) Hélas, la carrière de Goldberg fut stoppée net par la tuberculose et il mourut en 1756, quelques semaines après son vingt-neuvième anniversaire. Les variations constituent une quasi-encyclopédie de tous les possibles en matière d’écriture inventive pour clavecin, mais elles valent encore davantage par leur brillant traitement du thème—le thème et chaque variation sont en deux moitiés de seize mesures chacune, généralement scindées en phrases de deux mesures, et Bach parvient pourtant à éviter tout sentiment d’affreuse symétrie et, plus encore, de monotonie. Maître dans l’art de transcrire sa musique pour diverses combinaisons instrumentales, Bach aurait sûrement été séduit par l’arrangement pour trios à cordes que Dmitri Sitkovetsky fit de ses Variations. Tout comme Mozart arrangea pour quatuor à cordes certaines fugues pour clavier des «48», tout comme d’autres arrangèrent, pour la même formation, L’art de la fugue, Sitkovetsky releva le défi qui consiste à repenser la musique bachienne pour de tout autres instruments—ce que Bach lui-même avait fait avec sa propre musique mais aussi avec celle de compositeurs comme Vivaldi, Telemann, Marcello et Torelli. Réalisé en 1985 pour le tricentenaire de la nissance de Bach, l’arrangement de Sitkovetsky est dédié à la mémoire de Glenn Gould, dont le fameux disque Columbia (1955) consacré aux Variations Goldberg fut un best-seller immédiat, qui fit découvrir cette musique extraordinaire à toute une génération—un succès qui se répéta d’ailleurs peu ou prou en 1981, quand Gould grava un nouvel enregistrement proposant une vision de l’œuvre moins bouillonnante, plus réfléchie. «Avant la Sonate Waldstein de Beethoven, les Variations Goldberg étaient la plus brillante démonstration instrumentale existante. Aucune autre œuvre de Bach ou de Domenico Scarlatti, ni même aucune page antérieure de Beethoven, n’a ce brio instrumental», peut-on lire sous la plume de Donald Tovey. Vu que ce brio tient en partie à l’écriture pour clavecin de Bach, il est curieux que ces variations aient d’abord connu un succès mondial dans la version pianistique de Gould, et non au clavecin, comme le spécifia Bach. Parmi les nombreux arrangements de ces Variations Goldberg figurent ceux pour deux pianos de Joseph Rheinberger (révisé par Max Reger); pour quatuor d’instruments à vent en bois d’Andrei Eshpai; pour orgue de Jean Guillou; pour guitare solo de József Eötvös—sans oublier celui, aux modifications plus drastiques, de Ferruccio Busoni (il retrancha dix variations et ajouta une coda de son cru) mais aussi une version pour trio de jazz signée par Jacques Loussier et les Gilded Goldbergs de Robin Holloway, brillamment réinventées. Le trio à cordes choisi par Sitkovetsky produit des résultats fascinants. Avec trois instruments au timbre plus ou moins similaire, les lignes contrapuntiques et imitatives offrent une grande transparence, surtout dans les variations canoniques nos 6, 9, 12, 15, 18, 21, 24 et 27; dans la Fughetta (variation 10) et le contrepoint fort argumenté de la variation 22; ou encore, enfin, dans l’imitation triomphante (fondée sur des airs traditionnels) du Quodlibet constitutif de la variation 30. Une réécriture intelligente cherche à obtenir une virtuosité équivalente à celle requise au clavecin: l’énergie enjouée de la variation 3 confie à l’alto un mouvement continu en doubles croches, dépassées et suivies par le violon et le violoncelle. Dans la variation 5, Sitkovetsky résiste à la tentation d’écrire une troisième partie, cependant que la texture à deux parties de la variation 6 est habilement redistribuée entre les trois instruments—la laissant sous forme de gigue à deux voix—, à l’instar de ce qui se passe dans la variation 11. Les croisements de mains complexes et la figuration de la variation 14 sont inventivement revisités en un dialogue entre les trois instrumentistes. La variation 16, quasi orchestrale, est un genre d’ouverture à la française miniature, particulièrement bien adaptée à la riche sonorité de l’instrumentation de Sitkovetsky. L’utilisation du pizzicato pour les doubles croches continues, dans la variation 19, peut surprendre, mais elle offre un séduisant changement de texture. L’écriture fort chromatique de la variation 25 fonctionne bien aux cordes, dont la capacité de soutien accrue permet de savourer au maximum les dissonances. L’élan frénétique de la variation 26 est, là encore, habilement redistribué au trio; dans la variation 28, il est fait un usage plus réussi du pizzicato, peut-être pour refléter la sonorité du clavecin, mais aussi pour alléger la texture. Les grandioses accords de la variation 29 sont, eux aussi, transcrits de manière convaincante. Surtout, le caractère de la musique est fort subtilement modifié par rapport à l’original bachien: l’une des différences manifestes tient à ce que le dialogue musical ressemble désormais à une véritable musique de chambre et, même si ce n’est pas ce que Bach avait en tête en écrivant ses Variations Goldberg, cela donne assurément une passionnante manière de réentendre l’œuvre. Johann Sebastian Bachs Goldberg-Variationen entstanden ursprünglich für ein Cembalo mit zwei Manualen und waren eines der wenigen Werke Bachs, die zu Lebzeiten des Komponisten veröffentlicht wurden, nämlich um 1741 vom Verlagshaus von Balthasar Schmid in Nürnberg. Die Original-Titelseite beschreibt das Werk als „Clavier Ubung bestehend in einer Aria mit verschiedenen Veraenderungen vors Clavicimbal mit 2 Manualen. Denen Liebhabern zur Gemüths-Ergetzung verfertiget von Johann Sebastian Bach“. Die hier zum Ausdruck kommende Idee eines Werks, das danach strebte, die Seele von Spielern wie Zuhörern anzurühren, war dabei durchaus ernst gemeint: Als gläubiger Lutheraner hatte Bach ein tiefes Bewusstsein für die spirituelle Dimension der Musik sowie für den Wunsch des Komponisten, nicht nur zu vergnügen und zu unterhalten, sondern auch die Seele zu erbauen. Doch war das Werk zugleich eine Meisterleistung der kompositorischen Großform: Wenn man die Präludien und Fugen des Wohltemperierten Klaviers als eigenständige Werkpaare zählt, dann stellen die Goldberg-Variationen das längste zusammenhängende Stück für ein Tasteninstrument dar, das im 18. Jahrhundert veröffentlicht wurde, und schon früh zogen sie auch international Aufmerksamkeit auf sich. Man stellt sich Bach oft als Komponisten vor, dessen Musik erst im 19. Jahrhundert wiederentdeckt wurde (vor allem dank Mendelssohn und Schumann), aber seine Musik für Tasteninstrumente bildete dabei eine gewisse Ausnahme, selbst außerhalb von Deutschland, und die Goldberg-Variationen wurden besonders geschätzt, wenn auch damals nur selten gespielt. In seiner wegweisenden General History of the Science and Practice of Music, erschienen 1776, widmet Sir John Hawkins Bach mehrere Seiten, wobei er Johann Christian Bach (der sich in den 1760er Jahren in London niedergelassen hatte) für Auskünfte zu seiner Darstellung von Bachs Leben dankt. Hawkins rundet seine Ausführungen zu Bach mit vollen drei Seiten an Musikbeispielen ab, darunter die „Aria“ sowie Variation 9 und 10 aus den Goldberg-Variationen, die somit eines der ersten Werke Bachs sind, die außerhalb Deutschlands im Druck erschienen. Es ist recht ungewöhnlich für Bach, dass sich in einem Werk für Tasteninstrument so präzise Angaben zur Besetzung finden: Für die Goldberg-Variationen schreibt er ein Cembalo mit zwei Manualen vor, während der Großteil seiner Tastenmusik für ein nicht näher beschriebenes „Clavier“ (Tasteninstrument) komponiert ist. Deutlich zeigt Bachs Stil hier aber Spuren von virtuoser Präsentation und bietet nicht nur dem Spieler ausgiebig Gelegenheit, seine Fingerfertigkeit und Ausdrucksspanne zu beweisen, sondern lässt auch das Instrument brillieren. sich oft in Leipzig aufhielt, und […] Goldberg mit dahin brachte, um ihn von Bach in der Musik unterrichten zu lassen. Der Graf kränkelte viel und hatte dann schlaflose Nächte. Goldberg, der bey ihm im Hause wohnte, mußte in solchen Zeiten in einem Nebenzimmer die Nacht zubringen, um ihm während der Schlaflosigkeit etwas vorzuspielen. Einst äußerte der Graf gegen Bach, daß er gern einige Clavierstücke für seinen Goldberg haben möchte, die so sanften und etwas muntern Charakters wären, daß er dadurch in seinen schlaflosen Nächten ein wenig aufgeheitert werden könnte. Bach glaubte, diesen Wunsch am besten durch Variationen erfüllen zu können. […] Der Graf nannte sie hernach nur seine Variationen. Er konnte sich nicht satt daran hören, und lange Zeit hindurch hieß es nun, wenn schlaflose Nächte kamen: Lieber Goldberg, spiele mir doch eine von meinen Variationen. Bach ist vielleicht nie für eine seiner Arbeiten so belohnt worden, wie für diese. Der Graf machte ihm ein Geschenk mit einem goldenen Becher, welcher mit 100 Louis d’or angefüllt war. Eine schöne Anekdote—und Ursprung des bekannten Mythos, dass die Variationen gegen Schlaflosigkeit helfen—, doch wie die meisten guten Geschichten scheint auch diese das Ergebnis einiger Ausschmückung zu sein. Goldberg wurde 1727 in Danzig geboren, war also zur Zeit des Besuchs von Bach bei Keyserlingk gerade erst ein Jugendlicher, weshalb es äußerst unwahrscheinlich ist, dass Bach die Variationen für ihn schrieb. Außerdem waren sie mit großer Sicherheit schon kurz vor Bachs Treffen mit Keyserlingk im Druck erschienen, was die Vermutung nahelegt, dass Bach dem Grafen ein Exemplar schenkte, nachdem er gefragt worden war, ob er etwas Passendes komponieren könne. Dies würde auch erklären, warum weder der Name des Grafen noch der von Goldberg auf dem Titelblatt der Erstausgabe erscheinen. Zudem taucht die „Aria“, auf der die Variationen basieren, im Notenbüchlein für Anna Magdalena Bach auf, das zum Großteil Jahre zuvor zusammengestellt wurde (obwohl Christoph Wolff die Auffassung vertritt, dass die „Aria“ etwa 1740 von Anna Magdalena auf noch leeren Seiten hinzugefügt wurde). Peter Williams äußert die Vermutung, dass Bach als Ausführenden für die Variationen höchstwahrscheinlich seinen Sohn Wilhelm Friedemann im Sinn hatte, einen hervorragenden Instrumentalisten, der seit 1733 als Organist an der Sophienkirche in Dresden tätig war. Dennoch war Goldberg allem Anschein nach ein hochtalentierter junger Musiker und Schüler sowohl von Johann Sebastian als auch von Wilhelm Friedemann Bach. Zu seinen Kompositionen zählen eine Reihe von Kantaten sowie Werke für Tasteninstrumente (auch wenn Forkel bemerkt, dass Goldbergs Spiel zwar brillant war, seine eigene Musik aber weniger bedeutsam), und es ist möglich, dass Bach dem jungen Goldberg das Thema zum Spielen gab. (Eine der plausibleren Behauptungen in der reizenden, aber weitgehend fiktiven Kleinen Chronik der Anna Magdalena Bach von Esther Meynell, erstmals 1925 veröffentlicht.) Leider setzte die Tuberkulose Goldbergs Laufbahn ein jähes Ende, und er starb 1756 wenige Wochen nach seinem 29. Geburtstag. Die Variationen stellen geradezu eine Enzyklopädie dessen dar, was im Hinblick auf erfindungsreiches Komponieren für Tasteninstrumente möglich war, und noch mehr beeindruckt das Stück durch Bachs geistreiche Behandlung des Themas—das Thema und alle Variationen bestehen aus zwei Hälften von je 16 Takten, für gewöhnlich in Zweitaktphrasen unterteilt, doch vermeidet Bach jeden Eindruck von schlichter Symmetrie oder gar Monotonie. Als Meister der Transkription von eigenen Werken für verschiedene Besetzungen hätte der Komponist an Dmitri Sitkowetskis Idee, die Goldberg-Variationen für Streichtrio zu bearbeiten, sicher Gefallen gefunden. Wie Mozart, der einige der Tastenfugen aus den „48“ für Streichquartett arrangierte, und andere, die Die Kunst der Fuge für die gleiche Besetzung bearbeitet haben, stellt sich auch Sitkowetski der Herausforderung, Bachs Musik mit ganz anderen Instrumenten neu zu denken—so wie Bach selber es nicht nur mit eigenen Werken, sondern auch mit anderen Komponisten wie Vivaldi, Telemann, Marcello oder Torelli tat. Sitkowetskis Bearbeitung entstand 1985 zur Feier von Bachs 300. Geburtstag und ist dem Andenken von Glenn Gould gewidmet, dessen gefeierte Einspielung der Goldberg-Variationen für Columbia 1955 sofort ein Verkaufsschlager wurde und einer ganzen Generation diese außerordentliche Musik näherbrachte—ein Erfolg, der sich 1981 praktisch wiederholte, als Gould das Werk erneut einspielte, diesmal in einer weniger überschwänglichen, bedächtigeren Interpretation. Donald Tovey schrieb: „Bevor Beethoven die Waldstein-Sonate schrieb, waren die Goldberg-Variationen das glänzendste Paradestück für schiere instrumentale Virtuosität, das es gab. Kein anderes Werk von Bach selbst oder von Domenico Scarlatti, nicht einmal die früheren Werke Beethovens kamen ihnen gleich, was die instrumentale Meisterschaft betrifft.“ Wenn man bedenkt, dass die von Tovey erwähnte Meisterschaft unter anderem daher rührt, wie Bach für das Cembalo schreibt, ist es verblüffend, dass die Variationen zuerst durch Goulds Version für Klavier weltberühmt wurden anstatt auf dem von Bach vorgesehenen Instrument. Es gibt zahlreiche Bearbeitungen der Goldberg-Variationen für verschiedene Besetzungen, darunter die für zwei Klaviere von Josef Rheinberger (revidiert von Max Reger), für Holzbläserquartett von Andrei Eschpai, für Orgel von Jean Guillou und für Solo-Gitarre von József Eötvös, außerdem die stärker veränderte Bearbeitung von Ferruccio Busoni (um zehn Variationen gekürzt und ergänzt durch eine Coda von Busoni selber), eine Version für Jazztrio von Jacques Loussier sowie die geistreich nachempfundenen Gilded Goldbergs von Robin Holloway. Sitkowetskis Wahl des Streichtrios liefert einige faszinierende Resultate. Bei drei Instrumenten mit prinzipiell ähnlichem Timbre treten die kontrapunktischen und imitierenden Linien mit großer Deutlichkeit hervor, vor allem in den kanonischen Variationen 6, 9, 12, 15, 18, 21, 24 und 27 oder in der Fughetta (Variation 10) und dem eng geflochtenen Kontrapunkt von Variation 22 oder schließlich in dem (auf Volksliedern basierenden) triumphalen Imitationssatz des Quodlibets, das Variation 30 bildet. Einige geschickte Umarbeitungen zielen darauf ab, die auf dem Cembalo erforderliche Virtuosität nachzuempfinden: Die Ausgelassenheit von Variation 3 schlägt sich in einer fortlaufenden Sechzehntel-Bewegung der Bratsche nieder, die von Geige und Cello umspielt wird. In Variation 5 widersteht Sitkowetski der Versuchung, eine dritte Stimme zu schreiben, während der zweistimmige Satz von Variation 6—ohne die Stimmenzahl dieser Gigue zu verändern—gekonnt auf die drei Instrumente verteilt wird, wie auch in Variation 11. Das raffinierte Überkreuzen der Hände und die Verzierungen von Variation 14 werden erfindungsreich in einen Dialog zwischen den drei Streichern verwandelt. Die fast orchestrale Variation 16, quasi eine französische Ouvertüre im Kleinformat, kommt dem vollen Klang von Sitkowetskis Instrumentierung besonders entgegen. Der Gebrauch des Pizzicato für die fortlaufenden Sechzehntel in Variation 19 mag überraschen, bringt aber einen reizvollen Wechsel in der Gestaltung. Die starke Chromatik von Variation 25 kommt auf Streichinstrumenten gut zur Geltung, da die größere Klangdauer der Saiten es erlaubt, Dissonanzen voll auszukosten. Das hektische Treiben von Variation 26 ist wiederum gekonnt über das Trio verteilt, während in Variation 28 erneut wirkungsvoller Gebrauch vom Pizzicato gemacht wird, vielleicht nicht nur zur Auflockerung der Gestaltung, sondern auch in Nachahmung des Cembaloklangs. Die prächtigen Akkorde von Variation 29 sind ebenfalls überzeugend umgesetzt. Insgesamt wird der Charakter der Musik gegenüber Bachs Original sehr subtil verändert: Ein offensichtlicher Unterschied besteht darin, dass der musikalische Dialog jetzt wirklich kammermusikalische Gestalt annimmt, und obwohl dies nicht Bachs Absicht war, als er die Goldberg-Variationen schrieb, eröffnet sich dennoch ein spannender Weg, das Werk neu zu hören. The Aria that Bach uses as the theme for his variations appears in the notebook of pieces he began collecting for his second wife, Anna Magdalena, in 1725. Until recently it was thought to have existed for at least ten years before Bach chose it as his theme, but musicologists now think it was written expressly for the purpose and copied into two spare pages of the notebook. This is largely irrelevant; what is important is its character and rhythm—that of a dignified, stately sarabande, full of tenderness and poise. It is highly embellished in the French manner—meaning that the ornaments are an essential part of the melodic line, not optional extras. Rather than the melody, however, it is the bass line, or more specifically the harmonies which it implies, that is used as a basis for the thirty variations which follow. Throughout we have the same overall harmonic structure of four 8-bar phrases (or 4-bar phrases depending on the time signature): the first establishes the tonic of G major; the second moves to the dominant; after the double bar (repeat) it moves from the dominant to the relative (E minor), increasing the tension, before returning home to the tonic in the final 8 bars (after which the second half is repeated). Three variations are in G minor, where E flat major is substituted for E minor, adding some light to the darker mode (except in the remarkable Variation 25 which remains sombre by passing through E flat minor). On this solid base, Bach builds a magnificent edifice that is both beautifully proportioned and astonishingly varied. The variations are organized into groups of three, with every third variation being a canon. In these, the upper two voices engage in exact imitation, beginning at the unison in Variation 3, and moving up step by step so that Variation 27 is a canon at the ninth. They are among the most vocal in character of the variations, and are so ingeniously put together that we can listen to them without thinking of their construction, although that of course adds to our enjoyment and intellectual stimulation. Each group begins with a free variation (often akin to a dance but still very contrapuntal). The second of the set is a toccata for two keyboards, with the most brilliant variations belonging to this group. Here Goldberg would really have had the chance to show off his virtuosity. L’Aria utilisée par Bach comme thème de ses variations apparaît dans le cahier de pièces que le compositeur commença de rassembler pour sa seconde épouse, Anna Magdalena, en 1725. Jusqu’à récemment, l’on considérait que cette pièce existait depuis déjà dix ans, au moins, lorsque Bach la choisit pour thème, mais les musicologues estiment désormais qu’elle fut écrite expressément, à dessein, et copiée sur deux pages en surplus du cahier. Ce qui est en grande partie dénué d’intérêt; seuls le caractère de l’œuvre, son rythme importent—ceux d’une sarabande digne et majestueuse, toute de sensibilité et d’équilibre, qui est fort embellie, à la manière française, et dont les ornements sont, en conséquence, une part essentielle de la ligne mélodique, non des suppléments facultatifs. Davantage que la mélodie, cependant, c’est la ligne de basse, ou plus précisément les harmonies qu’elle insinue, qui sert de base aux trente variations suivantes. Tout du long, nous observons la même structure harmonique globale de quatre phrases de huit mesures (ou de phrases de quatre mesures, selon le signe de la mesure): la première établit la tonique de sol majeur; la deuxième se meut à la dominante; après la double barre (reprise), nous passons de la dominante au relatif (mi mineur), avec un accroissement de la tension, avant de revenir à la tonique dans les huit dernières mesures (après quoi la seconde moitié est reprise). Trois variations sont en sol mineur, et mi bémol majeur est alors substitué à mi mineur, jetant quelque lumière sur le mode plus sombre (excepté dans la remarquable Variation 25, qui demeure sombre en passant par mi bémol mineur). Sur cette base solide, Bach érige un magnifique édifice, à la fois superbement proportionné et étonnamment varié. Les variations sont organisées par groupes de trois, et toutes les troisièmes variations sont des canons, où les deux voix supérieures s’engagent dans une imitation stricte, qui débute à l’unisson dans la Variation 3 pour atteindre, avec la Variation 27, un canon à la neuvième. Ces variations, qui comptent parmi les plus vocales, sont ingénieusement rassemblées de manière à ce que nous puissions les écouter sans penser à leur construction, quoique cette dernière ajoute naturellement à notre plaisir et à notre stimulation intellectuelle. Chaque groupe s’ouvre sur une variation libre (souvent apparentée à une danse, mais encore très contrapuntique). Puis vient une toccata pour deux claviers—les variations les plus brillantes appartiennent à ce genre. Là, Goldberg avait vraiment l’occasion de démontrer sa virtuosité. Die Aria, die Bach als Thema für seine Variationen benutzt, erscheint in einem Notenbuch mit Stücken, die Bach 1725 für seine zweite Frau Anna Magdalena zu sammeln begann. Noch bis vor kurzem glaubte man, daß sie schon mindestens zehn Jahre existiert haben müsse, ehe Bach sie als Thema wählte, doch geht die Musikforschung heute davon aus, daß sie ausdrücklich zu diesem Zweck komponiert und dann in zwei freigebliebene Seiten des Notenbüchleins kopiert wurde. Das ist eher unerheblich; von Bedeutung sind Charakter und Rhythmus des Stücks—eine würdevolle, gesetzte Sarabande voller Zärtlichkeit und Selbstsicherheit. Es ist hochverziert in der französischen Manier—d.h. die Ornamente sind unverzichtbarer Bestandteil der Melodielinie, nicht beliebige Beigaben. Allerdings dient nicht die Melodie, sondern der Baß oder genauer die von ihm vorgegebene Harmonisierung als Grundlage der dreißig folgenden Variationen. Durchweg finden wir die gleiche harmonische Grundstruktur von jeweils vier achttaktigen Phrasen vor (oder viertaktigen, je nach Vorzeichen): Die erste etabliert die Tonika G-Dur, die zweite geht zur Dominante über; nach dem Doppelstrich (Wiederholung) geht sie von der Dominante zur Paralleltonart (e-Moll) über, wodurch die Spannung erhöht wird, ehe die letzten acht Takte zur Tonika zurückkehren (danach wird die zweite Hälfte wiederholt). Drei der Variationen stehen in g-Moll, wobei e-Moll durch Es-Dur ersetzt wird, was die eher dunkle Stimmung etwas aufheitert (außer in der bemerkenswerten Variation 25, die düster bleibt, indem sie es-Moll durchläuft). Auf dieser soliden Grundlage errichtet Bach ein großartiges Bauwerk, das ebenso wohlproportioniert wie erstaunlich vielfältig ist. Die Variationen sind in Dreiergruppen zusamengefaßt, und jede dritte Variation ist ein Kanon, dessen zwei Oberstimmen in strenger Imitation verlaufen—angefangen mit dem Einklang in der Variation 3 und dann jeweils eine Stufe aufsteigend, so daß die Variation 27 ein Kanon in der None ist. Diese Variationen gehören zu den am ehesten sanglich angelegten und sind so raffinert konstruiert, daß wir ihnen zuhören können, ohne auf ihren Aufbau zu achten, obwohl dessen Kenntnis natürlich den Genuß und das intellektuelle Vergnügen erhöht. Jede Gruppe beginnt mit einer freien Variation (oft einem Tanz verwandt, aber doch ausgesprochen kontrapunktisch). Die zweite Variation einer Gruppe ist jeweils eine Tokkata für zwei Tastaturen—die brillantesten Stücke gehören dieser Gattung. Hier hätte Goldberg wahrhaftig Gelegenheit gehabt, seine Virtuosität zu beweisen. Movement 02: Variation 1: a 1 Clav. Variation 1 sets the joyous tone that is characteristic of so much of this work. Both the leaps and the rhythm of the left hand in the first bar are motifs for joy in Bach’s music (as in the A flat major Prelude from Book I of The Well-Tempered Clavier). This two-part invention already gives us a taste of the hand-crossing that will be such a feature in later variations. La Variation 1 instaure le ton joyeux propre à une si grande part de l’œuvre. Les bonds et le rythme de la main gauche, dans la première mesure, sont des motifs de joie dans la musique de Bach (comme dans le Prélude en la bémol majeur du livre 1 du Clavier bien tempéré). Cette invention à deux voix nous donne un avant-goût des croisements de mains si caractéristiques des variations ultérieures. Die Variation 1 etabliert die frohe Stimmung, die für einen großen Teil des Werks charakteristisch ist. Sowohl die Sprünge als auch der Rhythmus der linken Hand im ersten Takt gelten in Bachs Musik als Freudenmotive (beispielsweise im As-Dur-Präludium aus dem ersten Band des Wohltemperierten Claviers). Diese zweistimmige Invention gibt uns einen Vorgeschmack auf das Überkreuzen der Hände, das in späteren Variationen so in den Vordergrund rücken wird. Movement 03: Variation 2: a 1 Clav. The one exception to the pattern of toccatas is Variation 2, which teases us at the beginning by almost being a canon. It is a simple three-part invention, similar to the Little Prelude in D major, BWV936, with two voices engaging in constant dialogue over a running bass. Perhaps Bach realized that we needed a bit more time to warm up before engaging in high jinks! La Variation 2, la seule à ne pas présenter de toccata en deuxième position, nous taquine d’abord en étant presque un canon. Il s’agit d’une simple invention à trois voix, semblable au Petit Prélude en ré majeur, BWV936, où deux voix s’engagent dans un constant dialogue par-dessus une basse ininterrompue. Peut-être Bach réalisa-t-il notre besoin d’un peu plus de temps pour nous mettre en train avant de nous payer du bon temps! Die einzige Abweichung vom Schema der Tokkata an zweiter Stelle ist die Variation 2, die uns anfangs damit neckt, daß sie fast als Kanon daherkommt. Es handelt sich um eine schlichte dreistimmige Invention, vergleichbar dem Kleinen Präludium in D-Dur BWV936, mit zwei fortlaufend dialogisierenden Stimmen über einem durchlaufenden Baß. Vielleicht meinte Bach, wir bräuchten ein wenig mehr Anlaufzeit, ehe der wahre Übermut einsetzt! Movement 04: Variation 3: Canone all'Unisuono. a 1 Clav. Then comes the first of the canons in Variation 3—this one at the unison (the upper voices beginning on the same note, one bar apart). 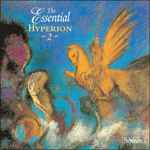 The time signature of 12/8 hints at a mood of pastoral simplicity with a touch of the dance. With the canonic voices being so close together, and played with the one hand, it is a challenge to distinguish them enough for the listener to be able to comprehend their constant crossings (this of course applies more to the piano than to the harpsichord). In the first four bars the left hand sets out the harmonies simply and gracefully, but then gets mor involved in filling out the texture. Survient ensuite le premier canon (Variation 3)—un canon à l’unisson (les voix supérieures commencent sur la même note, à une mesure d’écart). Le signe de la mesure (12/8) suggère une atmosphère de simplicité pastorale, avec une touche de danse. Les voix canoniques, jouées avec une seule main, sont tellement rapprochées que le défi consiste à les distinguer suffisamment pour que l’auditeur puisse appréhender leurs croisements incessants (ce qui est, naturellement, davantage possible au piano qu’au clavecin). Les quatre premières mesures voient la main gauche exposer les harmonies avec simplicité et grâce, avant de s’atteler à étoffer la structure. Es folgt der erste Kanon in der Variation 3—hier im Einklang geführt (d.h. die Oberstimmen setzen im Abstand eines Taktes auf der gleichen Note ein). Die Taktvorgabe 12/8 deutet auf eine Stimmung pastoraler Schlichtheit mit tänzerischem Anflug hin. Da die Kanonstimmen so eng beieinander liegen und mit der gleichen Hand gespielt werden, bedeutet es eine Herausforderung, sie so voneinander abzuheben, daß der Hörer in die Lage versetzt wird, ihr ständiges Überkreuzen zu erfassen (dies ist natürlich auf dem Klavier eher möglich als auf dem Cembalo). In den ersten vier Takten legt die linke Hand die Harmonien einfach und elegant dar, um sich dann eingehender mit dem Ausfüllen der Struktur zu befassen. Movement 05: Variation 4: a 1 Clav. A rustic-sounding dance in 3/8 time makes up Variation 4. The opening three notes constantly jump from voice to voice in playful imitation with syncopations adding extra interest. Une danse aux sonorités rustiques, à 3/8, constitue la Variation 4. Les trois notes d’ouverture sautent constamment d’une voix à l’autre, en une imitation enjouée, avec des syncopes ajoutant à l’intérêt. Ein rustikal klingender Tanz im 3/8-Takt bildet die Variation 4. Die ersten drei Noten springen ständig in spielerischer Imitation von einer Stimme zur anderen, und Synkopen machen das Stück noch interessanter. Movement 06: Variation 5: a 1 ô vero 2 Clav. Variation 5 uses the Italian type of hand-crossing, where one hand makes dangerous leaps over the other. The left hand is the first to have a go, soon followed by the right as Bach typically inverts the counterpoint. It is, as Wanda Landowska stated, ‘an outburst of irrepressible joy’. La Variation 5 recourt au croisement de mains italien, où une main effectue de dangeureux bonds par-dessus l’autre. La main gauche est la première à tenter le coup, bientôt suivie par la droite, car Bach, comme à son habitude, invertit le contrepoint. Pour citer Wanda Landowska, il s’agit d’«un accès de joie irrepressible». Die Variation 5 bedient sich der italienischen Variante des Überschlagens, bei der eine Hand gefährliche Sprünge über die andere ausführt. Die linke Hand ist zuerst am Zuge, bald gefolgt von der rechten, wenn Bach typischerweise den Kontrapunkt umkehrt. Es ist dies, wie Wanda Landowska gesagt hat, ein Ausbruch unbändiger Freude. Movement 07: Variation 6: Canone alla Secunda. a 1 Clav. Variation 6 is a canon at the second, and what better motif for that than a descending scale? It alternates beautifully between rising and falling, and the shadowing of the leader by the ensuing voice is not without tenderness. La Variation 6 est un canon à la seconde, et quel meilleur motif de calme qu’une gamme descendante? Elle alterne magnifiquement entre ascension et descente, et la seconde voix ombrage la première non sans quelque délicatesse. Die Variation 6 ist ein Kanon in der Sekunde, und welch besseres Motiv gäbe es dafür als eine absteigende Tonleiter? Sie alterniert wunderbar zwischen Auf und Ab, und die Art, wie sich die nachfolgende Stimme der Leitstimme an die Fersen heftet, hat etwas Zärtliches. Although the autograph manuscript of the ‘Goldberg’ Variations has been lost, we do have a copy of the original edition (published by Balthasar Schmid in Nürnberg) that is notated in Bach’s own hand (Handexemplar). As it was discovered as recently as 1974, only editions published after that date take into account the findings therein. Several tempo markings are added, in particular ‘Al tempo di Giga’ for Variation 7. Presumably Bach wanted to guard against taking too slow a tempo, thus making it a siciliano or forlana. It is, in fact, a French gigue, very similar to the one in the French Overture, BWV831. Its dotted rhythms and sharp ornaments make it one of the most attractive of the variations. Le manuscrit autographe des Variations «Goldberg» a été perdu, mais nous disposons d’une copie de l’édition originale (publiée par Balthasar Schmid, à Nürnberg), annotée de la main même de Bach (Handexemplar). Sa découverte ne remontant qu’à 1974, seules les éditions postérieures à cette date la prennent en compte. Plusieurs indications de tempo sont ainsi ajoutées, notamment «Al tempo di Giga» pour la Variation 7—Bach voulut probablement se prémunir contre un tempo trop lent, qui se serait traduit par une sicilienne ou une forlana. Cette pièce est, en réalité, une gigue française, très similaire à celle de l’Ouverture à la française, BWV831. Ses rythmes pointés et ses ornements cinglants en font l’une des variations les plus attrayantes. Das Autograph der „Goldberg-Variationen“ ist zwar verlorengegangen, doch wir besitzen ein Exemplar der von Balthasar Schmid in Nürnberg herausgegebenen Originalausgabe mit eigenhändigen Anmerkungen von Bach (ein sog Handexemplar). Da es erst 1974 wiederentdeckt wurde, enthalten nur Ausgaben, die nach diesem Datum erschienen sind, die daraus gezogenen Schlüsse. Dort sind mehrere Tempoangaben hinzugefügt, insbesondere „Al tempo di Giga“ für die Variation 7. Vermutlich wollte Bach verhindern, daß ein zu langsames Tempo angeschlagen und eine siciliana oder forlana daraus wurde. Tatsächlich handelt es sich um eine französische Gigue ähnlich der in der Französischen Ouvertüre BWV831. Ihre punktierten Rhythmen und präzisen Verzierungen machen sie zu einer der attraktivsten Variationen. Movement 09: Variation 8: a 2 Clav. Technical difficulties resume in Variation 8, with some treacherous overlapping of the hands. This is hand-crossing in the French style where both are playing at once in the same part of the keyboard. On the piano this poses singular problems and requires great care if it is not to sound confused. As in all the toccata variations, switching the odd note or passage to the other hand from which it is written certainly helps, as long as the voice-leading is still absolutely clear. The rhythm of Variation 8 can also be confusing; without seeing the score, some people will hear the beginning in 6/8 instead of 3/4 time. It is perhaps best to slightly emphasize the beats to avoid being misled. The hands alternate between moving towards or away from each other—rather like some kind of technical study—with the crossing of the arms providing visual excitement. Les difficultés techniques reprennent dans la Variation 8, avec quelques perfides chevauchements de mains inhérents au croisement de mains dans le style français, où les deux mains jouent en même temps, dans la même partie du clavier. Ce qui pose de singuliers problèmes au piano et requiert une grande attention pour ne pas sombrer dans la confusion. Comme dans toutes les variations-toccatas, exécuter la note ou le passage bizarre à l’autre main que celle écrite aide certainement, pour autant que le mouvement des voix soit toujours absolument clair. Le rythme de la Variation 8 peut, lui aussi, être déroutant: sans la partition sous les yeux, d’aucuns entendront le début à 6/8, non à 3/4. Mieux vaut peut-être accentuer légèrement les temps pour éviter d’être induit en erreur. Les mains alternent entre rapprochement et éloignement mutuels—plutôt comme une sorte d’étude technique—le croisement des bras offrant une animation visuelle. In der Variation 8 treten wieder technische Schwierigkeiten auf, mit tückischem Überkreuzen der Hände. Dies ist Überschlagen im französischen Stil, bei dem beide Hände gleichzeitig im selben Bereich der Tastatur spielen. Auf dem Klavier ergeben sich daraus besondere Probleme, und große Sorgfalt ist nötig, um das Ganze nicht wirr klingen zu lassen. Wie bei allen Tokkatenvariationen ist es wohl hilfreich, die eine oder andere Note oder Passage auf die andere Hand als die ursprünglich vorgesehene zu übertragen—vorausgesetzt, die Stimmführung bleibt absolut klar. Auch der Rhythmus der Variation 8 kann zu Verwirrung führen; wer nicht die Partitur vor Augen hat, läuft Gefahr, den Anfang im 6/8- statt 3/4-Takt zu hören. Das beste dürfte wohl sein, die Taktschläge ein wenig zu betonen, um jede Irreführung zu vermeiden. Die Hände bewegen sich abwechselnd voneinander fort und aufeinander zu—fast wie bei einer technischen Übung—, wobei das Überkreuzen der Arme einen optischen Anreiz bietet. Movement 10: Variation 9: Canone alla Terza. a 1 Clav. The next canon, Variation 9, is at the interval of a third. Beautifully lyrical, flowing yet unhurried, its expressiveness is supported by a more active bass line than in the previous canons. Le canon suivant, la Variation 9, est à la tierce. Superbement lyrique, fluide et pourtant serein, il voit son expressivité soutenue par une ligne de basse plus active que dans les canons précédents. Der nächste Kanon, die Variation 9, steht im Intervall einer Terz. Wunderbar lyrisch, fließend, doch bedächtig, wird seine Ausdruckskraft noch von einer aktiveren Baßlinie als in den vorangegangenen Kanons unterstützt. Movement 11: Variation 10: Fughetta. a 1 Clav. Variation 10 is a fughetta in four parts—very genial in nature, and reminding me of the D major March from the Anna Magdalena Notebook, also marked ‘alla breve’ (and now thought to be composed by Bach’s son, Carl Philipp Emanuel). La Variation 10 est une fughetta à quatre voix—de nature véritablement géniale, elle me rappelle la marche en ré majeur du Petit Livre d’Anna Magdalena, également marquée «alla breve» (l’on pense aujourd’hui qu’elle fut composée par le fils de Bach, Carl Philipp Emanuel). Die Variation 10 ist eine vierstimmige Fughetta—vom Wesen her ausgesprochen liebenswürdig, erinnert sie mich an den D-Dur-Marsch aus dem Notenbuch für Anna Magdalena, der ebenfalls „alla breve“ markiert ist (und heute dem Bach-Sohn Carl Philipp Emanuel zugeschrieben wird). Movement 12: Variation 11: a 2 Clav. More overlapping of the hands occurs in Variation 11, a gentle gigue-like toccata in 12/16 time which requires great delicacy. It makes use of crossing scales (which, even on one keyboard, must be seamless) and some capricious arpeggios and trills, the whole dissolving into thin air at the end. Les mains se chevauchent davantage dans la Variation 11, douce toccata de type gigue, à 12/16, requérant force sensibilité. Elle utilise les gammes croisées (qui, même sur un seul clavier, doivent être homogènes) et quelques arpèges et trilles fantasques, le tout se volatilisant à la fin. Weiteres Überkreuzen der Hände kommt in der Variation 11 vor, einer sanften, an eine Gigue gemahnenden Tokkata im 12/16-Takt, die großes Feingefühl verlangt. Sie verwendet einander überkreuzende Tonleitern (die auch auf einer Tastatur nahtlos klingen müssen) sowie einige kapriziöse Arpeggien und Triller, und am Schluß löst sich das Ganze in Luft auf. Movement 13: Variation 12: Canone alla Quarta. a 1 Clav. Then Bach gives us the first of the canons in inversion (where the second voice is in contrary motion to the first). Variation 12, a canon at the fourth, is also the first one where the voices reverse their leadership role after the double bar. I find something very regal in its character, and therefore think it shouldn’t be hurried. Bach nous offre ensuite le premier canon renversé (où la seconde voix est en mouvement contraire par rapport à la première). La Variation 12, un canon à la quarte, est la première où les voix inversent leur rôle de chef de file après la double barre. Je trouve quelque chose de fort régalien dans son caractère et il ne faut, me semble-t-il, pas trop la brusquer. Danach bietet uns Bach den ersten Kanon in Umkehrung (d.h., die zweite Stimme steht in Gegenbewegung zur ersten). Die Variation 12, ein Kanon in der Quarte, ist die erste Variation, bei der die Stimmen nach dem Doppelstrich die Führungsrolle wechseln. Ich finde ihn vom Charakter her ausgesprochen majestätisch und meine daher, daß er nicht übereilt werden darf. Movement 14: Variation 13: a 2 Clav. This brings us to Variation 13—one of the most sublime and, I feel, something of an emotional turning-point in the work. If most of the preceding variations are fairly terrestrial, although wonderful in their dance-like rhythms, Variation 13 truly transports us for the first time. Its tender, cantabile melody, resembling a slow (but not too slow!) movement from a concerto, soars above the accompanying voices, using some violin figurations and two-note ‘sighs’ in the cadential bars. A few chromaticisms in the left hand towards the end serve only to enhance our state of bliss. Nous arrivons à la Variation 13—l’une des plus sublimes, à mon sens une sorte de tournant émotionnel dans l’œuvre. Si la plupart des variations précédentes sont plutôt terrestres, quoique merveilleuses dans leurs rythmes dansants, la nº 13 est la première à nous transporter véritablement. Sa tendre mélodie cantabile, ressemblant à un mouvement lent (mais pas trop!) de concerto, s’élève au-dessus des voix accompagnantes, en employant quelques figurations violonistiques et des «soupirs» de deux notes dans les mesures cadentielles. Quelques chromatismes à la main gauche, vers la fin, ne servent qu’à exhausser notre félicité. Damit kommen wir zur Variation 13—einer der vollendetsten, die nach meinem Empfinden gewissermaßen ein emotionaler Wendepunkt des Werks ist. Während die meisten der vorangegangenen Variationen eher erdverbunden sind (wenn auch mit wunderbaren Tanzrhythmen), versetzt uns die Nummer 13 erstmals richtig in Verzückung. Ihre zarte, cantabile geführte Melodie, die einem langsamen (aber nicht zu langsamen!) Konzertsatz gleicht, schwingt sich über die Begleitstimmen auf, und zwar unter Verwendung einiger Geigenfigurationen und zweitöniger „Seufzer“ in den Kadenztakten. Ein wenig Chromatik in der linken Hand gegen Ende steigert unsere Glückseligkeit noch. Movement 15: Variation 14: a 2 Clav. Staying in the same part of the keyboard, but with the hands exchanging places, Bach wakes us from our dream with a sharp, cheerful mordent beginning Variation 14. This same mordent is then the sole feature of a passage which takes us down the full range of his keyboard (changing to an ascent after the double bar). We are so often told that all ornaments must be executed on the beat in Baroque music, but here Bach writes them out in full before the beat. So much for the rules! Demeurant dans la même partie du clavier, mais avec les mains échangeant leurs places, Bach nous tire de notre rêve avec un mordant vif, gai, au début de la Variation 14. Ce mordant est ensuite l’unique caractéristique d’un passage qui nous fait descendre tout le clavier (se changeant en ascension après la double barre). L’on nous dit souvent que tous les ornements doivent être exécutés sur le temps dans la musique baroque, mais ici Bach les écrit en toutes notes avant le temps. Voilà pour les règles! Im selben Bereich der Tastatur, aber mit einem Wechsel der Hände, weckt uns Bach mit einem scharfen, fröhlichen Mordent, der die Variation 14 einleitet, aus unserer Träumerei. Dieser Mordent ist dann auch das bestimmende Element einer Passage, die uns über den gesamten Umfang seiner Tastatur hinabführt (nach dem Doppelstrich wird daraus ein Aufstieg). Man schärft uns immer wieder ein, daß Verzierungen in der Barockmusik stets auf dem Takt auszuführen sind, aber hier schreibt Bach sie vollständig aus, und zwar vor dem Takt. So viel zu den Regeln! Movement 16: Variation 15: Canone alla Quinta. a 1 Clav. After this brilliant outburst, Variation 15 presents us with a canon at the fifth and the first of the minor-key variations. I think it very fitting that it is in contrary motion, as the downward movement, with its ‘sighing’ figures adopted from Variation 13, is very sorrowful, but its ascending counterpart brings hope. Bach was unable to accept total despair because of his deep religious faith, and this variation is a perfect example of how he expressed this in music. The tempo marking is Andante, and the time signature 2/4, so it must flow despite its sorrow. The bass line is a full participant in the drama, imitating the sighs and wide intervals of the upper voices. There is a wonderful effect at the very end: the hands move away from each other, with the right suspended in mid-air on an open fifth. This gradual fade, leaving us in awe but ready for more, is a fitting end to the first half of the piece. Après cette brillante explosion, la Variation 15 nous offre un canon à la quinte et la première variation mineure. Il me semble tout à fait approprié qu’elle soit en mouvement contraire, car le mouvement descendant, avec ses figures «soupirantes» empruntées à la Variation 13, est fort affligé, tandis que son équivalent ascendant est porteur d’espérance. Sa profonde foi religieuse interdisait à Bach d’accepter le désespoir total, et la présente variation illustre parfaitement la manière dont il exprima cette réalité dans sa musique. L’indication de tempo étant Andante et le signe de la mesure 2/4, la pièce doit être fluide en dépit de son affliction. La ligne de basse participe pleinement au drame, imitant les soupirs et les larges intervalles des voix supérieures. La toute fin recèle un merveilleux effet: les mains s’éloignent l’une de l’autre, la droite étant suspendue en plein ciel, sur une quinte à vide. Cette disparition graduelle, qui nous laisse impressionnés mais prêts à davantage encore, clôt idéalement la première moitié de l’ouvrage. Nach diesem brillanten Erguß präsentiert uns die Variation 15 einen Kanon in der Quinte und die erste der Variationen in Moll. Ich halte es für passend, daß er in Gegenbewegung geführt ist, da der Abstieg nach unten mit seinen „seufzenden“, aus der Variation 13 übernommenen Figuren ausnehmend kummervoll wirkt, das aufsteigende Gegenstück hingegen Hoffnung bringt. Bach war in seiner tiefen Gläubigkeit außerstande, völlige Verzweiflung zu akzeptieren, und diese Variation ist ein perfektes Beispiel dafür, wie er dies in seiner Musik zum Ausdruck gebracht hat. Das Tempo ist mit Andante, der Takt als 2/4 angegeben, also muß das Stück trotz seiner Trauer fließen. Die Baßlinie nimmt vollen Anteil an dem Drama, indem sie die Seufzer und weitgespannten Intervalle der Oberstimmen imitiert. Ganz am Schluß wird ein wunderbarer Effekt erzielt: Die Hände bewegen sich voneinander weg, und die rechte verharrt über einer leeren Quinte in der Luft. Dieses allmähliche Abklingen, das uns voller Ehrfurcht, aber in Erwartung des Weiteren zurückläßt, ist ein passender Abschluß zur ersten Hälfte des Werks. Movement 17: Variation 16: Ouverture. a 1 Clav. 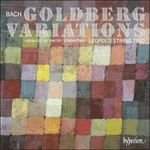 The ‘Goldberg’ Variations are usually considered to be the fourth part of Bach’s Clavierübung (‘Keyboard Practice’), although he didn’t specify them as such. The first volume comprised the six ‘Partitas’, the second the ‘Italian Concerto’ and the ‘French Overture’, and the third various organ compositions along with the ‘Four Duets’. In each of these, a French overture figures prominently: as the opening of the Fourth Partita in D major; again as the opening of the work by that name in the second volume; and as the Prelude of the E flat major Prelude and Fugue for organ, BWV552, in Part Three. In the ‘Goldberg’ Variations, as Variation 16, it ceremoniously opens the second half with great pomp and splendour. It is in two sections: the first—very grandiose with running scales, brilliant trills and sharply dotted rhythms—takes us as far as the dominant key in bar 16. After the repeat follows a faster, fugal section as is customary in a French overture. Here the texture is much more transparent but still very orchestral, and we have two quick bars of 3/8 for each bar of the original harmony. Les Variations «Goldberg» sont généralement considérées comme la quatrième partie de la Clavierübung («Exercice de clavier»), bien que Bach ne spécifiât jamais rien de tel. Le premier volume comprenait les six «Partitas», le deuxième le «Concerto italien» et l’«Ouverture à la française», et le troisième diverses compositions pour orgue, ainsi que les «Quatre duos». Dans chacun de ces volumes, une Ouverture à la française occupe le premier plan, ainsi l’ouverture de la Quatrième partita en ré majeur; l’ouverture de l’œuvre du même nom dans le deuxième volume et le prélude du Prélude et Fugue pour orgue en mi bémol majeur, dit «Sainte Anne», dans la Partie III. Dans la Variation 16, cette ouverture, qui inaugure cérémonieusement la seconde moitié des «Goldberg», avec force pompe et splendeur, compte deux sections. La première—extrêmement grandiose, avec des gammes ininterrompues, des trilles brillants et de vifs rythmes pointés—nous entraîne jusqu’à la dominante (mesure 16). Puis, la reprise est suivie d’une section fuguée plus rapide, comme de coutume dans une ouverture à la française. La texture est beaucoup plus transparente, quoique toujours très orchestrale, et nous avons deux mesures rapides à 3/8 pour chaque mesure de l’harmonie originale. Die „Goldberg-Variationen“ werden allgemein als vierter Teil von Bachs Clavierübung angesehen, obwohl er sie nicht ausdrücklich als solchen bezeichnet hat. Der erste Teil umfaßte die sechs Partiten, der zweite das Italienische Konzert und die Französische Ouvertüre, der dritte verschiedene Orgelkompositionen sowie die Vier Duette. In jedem Teil nehmen französische Ouvertüren einen bedeutenden Platz ein: Als Anfang der vierten Partita in D-Dur, wiederum als Anfang des entsprechenden Werks im zweiten Teil und als Vorspiel des Präludiums und Fuge für Orgel in Es-Dur im dritten. In den „Goldberg-Variationen“ eröffnet sie als Variation 16 feierlich die zweite Hälfte mit Pracht und Pomp. Sie besteht aus zwei Teilen: Der erste—höchst grandios mit Tonleiterläufen, brillanten Trillern und nachdrücklich punktierten Rhythmen—führt uns bis zur Dominante im sechzehnten Takt. Nach der Wiederholung folgt ein schnellerer, fugaler Abschnitt, wie er in französischen Ouvertüren üblich ist. Hier ist die Struktur viel transparenter, aber immer noch ausgesprochen orchestral, und wir bekommen zwei schnelle, 3/8 markierte Takte für jeden Takt der ursprünglichen Harmonisierung geboten. Movement 18: Variation 17: a 2 Clav. Variation 17 is a spirited and light-footed toccata in which Bach obviously takes great delight in writing expressly for two keyboards. On the piano the hands are playing on top of each other for a lot of the time. La Variation 17 est une toccata fougueuse et légère, où Bach prend à l’évidence beaucoup de plaisir à écrire expressément pour deux claviers. Au piano, les mains jouent le plus souvent l’une sur l’autre. Die Variation 17 ist eine lebhafte, leichtfüßige Tokkata, bei der Bach offensichtlich großes Vergnügen daran hat, für zwei Tastaturen zu schreiben. Auf dem Klavier spielen die beiden Hände oft übereinander. Movement 19: Variation 18: Canone alla Sexta. a 1 Clav. He continues in a good-natured mood with Variation 18, a canon at the sixth. Much of this good nature is present in the bass line which skips happily about under the two canonic voices where suspensions are the name of the game. Bach déploie ensuite une atmosphère bon enfant dans la Variation 18, un canon à la sixte. L’essentiel de cette bonhomie repose sur la ligne de basse, qui sautille gaiement sous les deux voix canoniques, où tout est question de retards. Bach setzt die gute Laune in der Variation 18 fort, einem Kanon in der Sexte. Viel von dieser guten Laune kommt in der Baßlinie zum Ausdruck, die vergnügt unter den beiden kanonischen Stimmen umherhüpft, für die Vorhalte angesagt sind. Movement 20: Variation 19: a 1 Clav. Variation 19 is in the style of a passepied—a delicate, charming dance in 3/8 time. Different touches can be used to bring out the three motifs to good effect, varying the voicing for the repeats. La Variation 19 est dans le style d’un passepied, délicate et charmante danse à 3/8. Différents touchers peuvent être utilisés pour réaliser avec succès les trois motifs, en variant les voix pour les reprises. Die Variation 19 ist im Stil eines passepied gehalten—eines zierlichen, charmanten Tanzes im 3/8-Takt. Verschiedene Spielweisen können angewandt werden, um die drei Motive zur Geltung zu bringen, indem man die Intonation der Wiederholungen variiert. Movement 21: Variation 20: a 2 Clav. Here Bach is obviously writing for a performer who is totally fearless and in command of the instrument. It is not just a display of technique, however. The notes are nothing without the joy and humour that are present in abundance, especially when he engages in ‘batteries’ (a way of breaking chords) in bars 25 to 28. Ici, Bach écrit manifestement pour un interprète totalement intrépide et maître de son instrument. Mais cette pièce ne se résume pas à une simple démonstration de technique. Les notes ne sont rien sans la joie et l’humour qui abondent, surtout lorsque Bach se lance dans des «batteries» (une manière d’arpéger les accords), aux mesures 25 à 28. Hier schreibt Bach eindeutig für einen Solisten, der keine Furcht kennt und sein Instrument vollkommen unter Kontrolle hat. Dennoch handelt es sich keineswegs nur um ein technisches Renommierstück. Die Noten sind nichts ohne den reichlich vorhandenen Spaß und Humor, insbesondere dann, wenn er in den Takten 25 bis 28 „Batterien“ (staccato gebrochene Akkorde) zum Einsatz bringt. Movement 22: Variation 21: Canone alla Settima. a 1 Clav. As is typical with Bach, often the most joyous moments are followed by a complete change in mood, and Variation 21 takes us back to the key of G minor with maximum effect. The expressiveness of this canon at the seventh is emphasized by the chromatic descent of the bass which, in the third bar, picks up the swirling opening motif of the canon. It is poignant to be sure (especially with the unexpected and wonderful F natural in the last bar), but should not be unduly slow. True pathos in the minor key is yet to come. Comme toujours chez lui, les moments les plus joyeux précèdent un total changement d’atmosphère, et la Variation 21 nous ramène à la tonalité de sol mineur, avec un maximum d’effet. L’expressivité de ce canon à la septième est rehaussée par la descente chromatique de la basse qui, à la troisième mesure, reprend le motif d’ouverture tournoyant du canon. Cette pièce, assurément poignante (notamment avec l’inattendu, le merveilleux fa bécarre dans la dernière mesure), ne devrait cependant pas être trop lente. Le vrai pathos en mineur reste encore à venir. Wie es für Bach typisch ist, folgt auf die freudigsten Momente ein völliger Stimmungswechsel, und die Variation 21 führt uns höchst wirkungsvoll zurück zur Tonart g-Moll. Die Ausdrucksfülle dieses Kanons in der Septime wird durch den chromatischen Abstieg des Basses betont, der im dritten Takt das wirbelnde Eröffnungsmotiv des Kanons aufnimmt. Er ist wahrhaftig ergreifend (vor allem das unverhoffte, wunderbare F ohne Vorzeichen im letzten Takt), sollte aber nicht ungebührlich langsam angegangen werden. Echtes Pathos in Moll steht noch bevor. Movement 23: Variation 22: a 1 Clav. I always get a feeling of rebirth with the onset of Variation 22. The return to G major is partly responsible for this, but so too is the solidity of the four-part writing. Marked ‘alla breve’ and using much imitative dialogue in the style of a motet, it seems to begin a sequence which leads beautifully to the conclusion of the work. For someone who is intimately acquainted with the piece, the end is now in sight and we know where we have to go to get there. J’éprouve toujours un sentiment de renaissance lorsque commence la Variation 22, sentiment dû au retour à sol majeur, mais aussi à la solidité de l’écriture à quatre voix. Marquée «alla breve» et recourant à force dialogue imitatif en style de motet, elle semble initier une séquence qui conduit magnifiquement à la conclusion de l’œuvre. Pour qui connaît intimement la pièce, la fin est désormais en vue et nous savons où aller pour y parvenir. Mit Beginn der Variation 22 überkommt mich immer ein Gefühl der Neugeburt. Dafür ist teilweise die Rückkehr nach G-Dur verantwortlich, aber auch die Solidität des vierstimmigen Satzes. „Alla breve“ markiert und unter Verwendung von viel imitativem Dialog im Stil einer Motette scheint sie eine Sequenz einzuleiten, die wundervoll zum Abschluß des Werks hinleitet. Für jemanden, der mit dem Stück genauestens vertraut ist, kommt nun das Ende in Sicht, und wir wissen, wohin wir uns wenden müssen, um dorthin zu gelangen. Movement 24: Variation 23: a 1 Clav. Bach really has fun with Variation 23, in which the hands engage in a game of catch-me-if-you-can, displaying various gymnastics along the way. They end up tumbling on top of each other (bars 27 to 30), ending their routine brilliantly together on the last chord! These flurries of double-thirds and -sixths are really pushing the limits of keyboard technique as it existed at the time, paving the way for future composers. Again we have this wonderful feeling of joy and delight not just in the music itself but also in its execution. Bach s’amuse vraiment avec la Variation 23, où les mains prennent part à un jeu d’attrape-moi-si-tu-le-peux, avec, en chemin, des exhibitions de gymnastique, avant de finalement dégringoler l’une sur l’autre (mesures 27 à 30) pour brillamment terminer leur numéro ensemble, sur le dernier accord! Ces rafales de doubles tierces et sixtes repoussent véritablement les limites de la technique du clavier telle quelle existait à l’époque, pavant la voie aux compositeurs futurs. De nouveau, nous avons ce merveilleux sentiment de joie et de plaisir procuré par la musique même, mais aussi par son exécution. Bach treibt seinen Spaß mit der Variation 23, in der die Hände gewissermaßen Fangen miteinander spielen und unterwegs alle möglichen Kunststücke vollführen. Am Schluß turnen sie übereinander weg (Takte 27 bis 30) und beenden ihre akrobatische Nummer brillant zusammen auf dem letzten Akkord! Diese Schauer von Terzen- und Sextenparallelen gehen wahrhaft an die Grenzen der damals bekannten Klaviertechnik und bereiten zukünftigen Komponisten den Weg. Wiederum macht sich dieses herrliche Empfinden von Freude und Entzücken nicht nur an der Musik selbst, sondern auch an ihrer Ausführung bemerkbar. Movement 25: Variation 24: Canone all'Ottava. a 1 Clav. After such antics, the canon at the octave in Variation 24 creates a beautiful sense of repose. It is a pastoral in 9/8 time and the only canon where the leading voice switches between the parts in the middle of a section (bars 9 and 24). The major third in the right hand of the last bar leads perfectly into the minor third in the left hand beginning the next variation. Between these two chords, however, there is a total change of atmosphere. Passé pareilles cabrioles, le canon à l’octave de la Variation 24 est source d’une superbe sensation de repos. Cette pastorale à 9/8 est l’unique canon où la voix première change entre les parties au milieu d’une section (mesures 9 et 24). La tierce majeure, à la main droite, de la dernière mesure aboutit parfaitement à la tierce mineure, à la main gauche, qui ouvre la variation suivante. Ces deux accords sont cependant entrecoupés d’un total changement d’atmosphère. Nach derlei Possen schafft der Kanon in der Oktave der Variation 24 ein schönes Gefühl der Ruhe und Gelassenheit. Es handelt sich um eine Pastorale im 9/8-Takt und um den einzigen Kanon, bei dem mitten in einem Abschnitt die Leitstimme wechselt (Takte 9 und 24). Die große Terz in der rechten Hand im letzten Takt ist die perfekte Überleitung zur kleinen Terz der linken Hand, mit der die nächste Variation beginnt. Allerdings ändert sich zwischen diesen beiden Akkorden die Atmosphäre total. Movement 26: Variation 25: a 2 Clav. Variation 25 is, without a doubt, the greatest of all the variations, demanding the utmost in musicianship and expressiveness. Returning to the rhythm of the opening sarabande, Bach writes an arioso of great intensity and painful beauty in which the agonizing chromaticisms show that Romanticism is not far away. Famously called ‘the black pearl’ by Landowska, its slow tempo (marked Adagio by Bach in his Handexemplar) makes it much longer than any other variation although it has the same number of bars. The ‘repeated note’ ornament at the beginning, which was often used by Bach for a jump of a sixth in impassioned music, is wonderfully expressive and very vocal, and was adopted by Chopin who used it repeatedly. The final descent of the melody ends with a clashing appoggiatura on the tonic, after which the tension is released. As with Bach’s greatest works in this vein (I think of the sarabande from the Sixth Partita, for instance), we feel that the external world must not intrude on this most private of moments. La Variation 25, sans aucun doute la plus grandiose de toutes, exige une musicalité et une expressivité des plus intenses. Revenant au rythme de la sarabande d’ouverture, Bach écrit un arioso d’une grande intensité et d’une beauté douloureuse, dont les chromatismes déchirants montrent que le romantisme n’est pas bien loin. Fameusement surnommée «la perle noire» par Landowska, cette variation doit à son tempo lent (Bach la marque Adagio dans son Handexemplar) d’être beaucoup plus longue que toute autre—et ce malgré un nombre de mesures rigoureusement identique. L’ornement en «note répétée» du début, souvent utilisé pour un saut de sixte dans la musique fervente de Bach, est merveilleusement expressif et extrêmement vocal—Chopin, qui l’adopta, y recourut sans cesse. La descente finale de la mélodie se clôt par une retentissante appoggiature sur la tonique, au terme de laquelle la tension est relâchée. Comme toujours avec les plus grandes œuvres bachiennes de cette veine (je pense, par exemple, à la sarabande de la Sixième partita), nous ressentons combien le monde extérieur ne doit pas empiéter sur cet instant des plus intimes. Die Variation 25 ist zweifellos die großartigste von allen und verlangt dem Interpreten das Äußerste an musikalischem Können und Ausdruckskraft ab. Bach kehrt zum Rhythmus der einleitenden Sarabande zurück und schreibt ein Arioso von großer Intensität und schmerzlicher Schönheit, dessen qualvolle Chromatik beweist, daß die Romatik keineswegs in weiter Ferne liegt. Dieses Stück, von Wanda Landowska treffend als „schwarze Perle“ bezeichnet, ist wegen seines langsamen Tempos (von Bach in seinem Handexemplar Adagio markiert) viel länger als die anderen Variationen, obwohl es die gleiche Anzahl von Takten aufweist. Die Verzierung des wiederholten Tons zu Beginn, die Bach oft in leidenschaftlicher Musik für einen Sextsprung genutzt hat, ist wunderbar ausdrucksvoll und ausgesprochen sanglich—Chopin hat sie sich zu eigen gemacht und unablässig eingesetzt. Der endgültige Abstieg der Melodie endet mit einem dissonanten Vorschlag auf der Tonika, wonach die Spannung abgebaut wird. Wie bei Bachs bedeutendsten Werken dieser Art (ich denke z.B. an die Sarabande aus der Sechsten Partita) haben wir auch hier das Gefühl, die Außenwelt dürfe diesen privatesten aller Momente nicht stören. Movement 27: Variation 26: a 2 Clav. The hardest thing to pull off in a complete performance of the ‘Goldberg’ is to gather up the energy and concentration needed for Variation 26 after emptying everything from inside yourself in Variation 25. With only a few seconds’ break, you are thrown into another virtuoso toccata where, for a lot of the time, the arms are crossed over each other. Retaining the sarabande rhythm, but of course much faster, Bach nevertheless writes two time-signatures: 18/16 for the running semiquavers and 3/4 for the accompanying chords, with 18/16 winning out in the end when both hands take off and run in the last five bars. The appoggiaturas on the second beat of the bar (which I add on the repeats) were found in the Handexemplar and are not printed in every edition. They are effective if you feel like adding even more notes! Having successfully negotiated this one, you can feel you’re now on the home stretch. Rassembler l’énergie et la concentration nécessaires à la Variation 26 après avoir donné tout ce que l’on avait dans la Variation 25: telle est, sans nul doute, la chose la plus difficile à réaliser dans une intégrale des «Goldberg». Passé une pause de quelques secondes seulement, l’on est précipité dans une nouvelle toccata virtuose, où les bras se croisent la plupart du temps. Conservant le rythme de sarabande, tout en l’accélérant, bien sûr, Bach écrit toutefois deux signes de la mesure: 18/16 pour les doubles croches ininterrompues et 3/4 pour les accords d’accompagnement, 18/16 l’emportant finalement, lorsque les deux mains s’envolent, dans les cinq dernières mesures. Les appoggiatures sur le deuxième temps de la mesure (que j’ajoute aux reprises) furent découvertes dans le Handexemplar et ne sont imprimées dans aucune édition. Elles sont efficaces si vous avez envie d’ajouter encore plus de notes! Après être parvenu à négocier cette pièce, vous pouvez sentir que vous êtes désormais dans la dernière ligne droite. Das schwerste bei einer vollständigen Darbietung der „Goldberg-Variationen“ ist, die für die Variation 26 benötigte Energie und Konzentration zu sammeln, nachdem man in der Nummer 25 alles gegeben hat. Nach wenigen Sekunden Unterbrechung ist man einer weiteren virtuosen Tokkata ausgeliefert, bei der dauernd die Arme überkreuzt werden. Bach behält den Sarabandenrhythmus bei, wenn auch natürlich viel schneller, gibt aber dennoch zwei Takte vor: 18/16 für die Sechzehntelläufe und 3/4 für die Begleitakkorde, wobei die 18/16 am Ende den Sieg davontragen, wenn sich beide Hände in den letzten fünf Takten zu ihren Läufen aufmachen. Die Vorschläge auf dem jeweils zweiten Schlag des Takts (die ich bei den Wiederholungen hinzufüge) stammen aus dem Handexemplar und sind nicht in allen Druckausgaben enthalten. Sie sind effektvoll, wenn einem danach ist, noch mehr Noten hinzuzugeben! Wer diese Variation erfolgreich hinter sich gebracht hat, kann das Gefühl auskosten, sich nun auf der Zielgerade zu befinden. Movement 28: Variation 27: Canone alla Nona. a 2 Clav. The last canon, Variation 27, is at the interval of a ninth and is the only one in which Bach abandons a supporting bass. Staying within the harmonic outline of his theme, the two canonic voices chatter away in a friendly sort of dialogue, slightly tinged with mischief before coming to a very abrupt end. La Variation 27 est l’ultime canon (à la neuvième), le seul où Bach délaisse la basse de soutènement. Demeurant naturellement au sein du canevas harmonique de son thème, les deux voix canoniques palabrent dans une sorte de dialogue amical, quelque peu nué de malice et se closant de manière fort abrupte. Der letzte Kanon, Variation 27, steht in der None und ist der einzige, bei dem Bach auf den stützenden Baß verzichtet hat. Naturgemäß im harmonischen Rahmen seines Themas verbleibend, plappern die beiden kanonischen Stimmen in freundlichem, ein wenig mit Schabernack versetzem Zwiegespräch und verstummen dann äußerst abrupt. Movement 29: Variation 28: a 2 Clav. 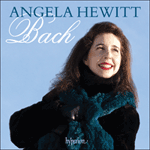 Bach then launches into Variation 28, a study in written-out trills if ever there was one. The continuing sense of joy is characterized by the wide leaps which accompany them and the bell-like notes which mark the beat. A good piano with an easy action and great clarity is necessary to bring this one off satisfactorily. Puis, Bach se lance dans la Variation 28, une étude en trilles écrits en toutes notes, pour peu que semblable pièce ait jamais existé. L’incessant sentiment de joie se caractérise par les amples sauts qui les accompagnent et par les notes carillonnantes qui battent la mesure. Mener cette variation à bien, de manière satisfaisante, exige un bon piano, doté d’une mécanique aisée et d’une grande clarté. Anschließend stimmt Bach die Variation 28 an, eine vorbildliche Übung in ausgeschriebenen Trillern. Die anhaltend freudige Stimmung äußert sich in den weiten Sprüngen, die diese Triller begleiten, sowie in den glockenartigen Tönen, die den Takt angeben. Ein gutes Klavier mit leichtem Anschlag und besonders klarem Ton ist vonnöten, um dieses Stück befriedigend darzubieten. Movement 30: Variation 29: a 1 ô vero 2 Clav. With no let-up allowed, the last of the toccatas, Variation 29, opens with joyous drumbeats in the left hand followed by chords hammered out on the two keyboards (or in this case one). Doubling the octave leaps in the left hand give it the required extra power. I feel it should begin somewhat like a free improvisation, but then be strictly in time for the descending cavalcades of notes that follow. If Beethoven comes to mind in the previous variation, then Liszt is surely not far away in this one! Sans aucun répit, la dernière toccata, la Variation 29, s’ouvre sur de joyeux battements de tambour à la main gauche, suivis d’accords martelés sur les deux claviers (sur un seul ici). Doubler les sauts d’octave à la main gauche confère à la pièce le supplément de puissance requis. À mon sens, cette variation devrait commencer un peu comme une improvisation libre, mais redevenir stricte pour les cavalcades de notes descendantes qui suivent. Si Beethoven nous vient à l’esprit dans la variation en trilles, alors Liszt n’est sûrement pas loin dans cette variation-là! Ohne eine Ruhepause zuzulassen beginnt die letzte der Tokkaten, die Variation 29, mit fröhlichen Trommelschlägen der linken Hand, gefolgt von Akkorden, die auf beiden Tastaturen (oder in diesem Fall auf einer) heruntergehämmert werden. Das Verdoppeln der Oktavsprünge der linken Hand liefert die benötigte zusätzliche Intensität. Ich meine, das Stück sollte fast wie eine freie Improvisation einsetzen, aber bei den folgenden abfallenden Tonkavalkaden streng den Takt einhalten. Wenn einem bei der Trillervariation Beethoven in den Sinn kommt, dann ist sicherlich bei dieser Liszt nicht weit entfernt! Movement 31: Variation 30: Quodlibet. a 1 Clav. I’ve not been with you for so long. Cabbage and beets drove me away. Had my mother cooked some meat then I’d have stayed much longer. In choosing these folksongs, Bach deftly combines his sublime thoughts with the everyday, and brings us a conclusion full of warmth and joy. For someone who was always a workaholic and to whom discipline came naturally (even in the last days of his life he didn’t let blindness deter him, and dictated his final work to his pupil and son-in-law Altnikol), he also certainly knew how to enjoy life and to share his humanity with us. Je n’ai pas été avec toi depuis si longtemps. Viens plus près, plus près, plus près. Les choux et les betteraves m’ont fait fuir. Si ma mère avait cuisiné de la viande, je serais resté bien plus longtemps. En choisissant ces airs populaires, Bach mêle adroitement ses pensées sublimes au quotidien pour nous amener à une conclusion toute de chaleur et de joie. Pour quelqu’un qui fut toujours un «bourreau de travail», à qui la discipline venait naturellement (même dans les derniers jours de son existence, il ne se laissa pas décourager par la cécité et dicta son ultime œuvre à son élève et gendre, Altnikol), il savait assurément comment jouir de la vie et nous faire partager son humanité. Sie leitet uns triumphal in die Variation 30 über, bei der wir einen Kanon in der Dezime erwarten—aber Bach hat immer eine Überrraschung parat. In diesem Fall ist es ein Quodlibet (wörtlich: „was beliebt“). Das Quodlibet war eine Art musikalischer Scherz, in dem populäre Lieder, gewöhnlich gegensätzlichen Charakters, gegeneinandergestellt wurden. Das konnte bei einer Familienfeier geschehen, gewöhnlich nach einer herzhaften Mahlzeit mit viel Bier und Wein. Wir wissen, daß die Familie Bach (die riesengroß war und in der es von Berufsmusikern wimmelte) solche Zusammenkünfte abhielt, wobei sie ihre Feste gottesfürchtig mit einem Choral begann und im krassen Gegensatz dazu mit einem improvisierten Quodlibet beendete, dessen Text bewußt humorvoll und oft ausgesprochen frech war. Für die abschließende Variation hat Bach zwei Volkslieder gewählt, mit den Titeln „Ich bin so lang nit bey dir gwest“ und „Kraut und Rüben haben mich vertrieben“. Indem er diese Volkslieder wählt, verbindet Bach geschickt seine erhabenen Ideen mit dem Alltäglichen und bietet uns einen Abschluß voller Wärme und Frohsinn. Für jemanden, der immer als arbeitswütig galt und dem Disziplin zur zweiten Natur geworden war (selbst in den letzten Tagen seines Lebens ließ er sich von seiner Erblindung nicht daran hindern, seinem Schüler und Schwiegersohn Altnikol sein letztes Werk zu diktieren), wußte er sehr wohl das Leben zu genießen und seine Menschlichkeit mit uns zu teilen. But now the party is over, the crowd disperses, and the Aria returns, as if from afar. Rather than stating it affirmatively, as it appeared at the beginning, it should appear veiled and even more beautiful in retrospect. Surely this is one of the most moving moments in all of music, and it speaks to us with great simplicity. Our journey has come to an end, yet we are back where we began. There is something in it of Divinity more than the ear discovers. It is an Hieroglyphical and shadowed lesson of the whole World, and creatures of God; such a melody to the ear, as the whole World, well understood, would afford the understanding. In brief it is a sensible fit of that Harmony which intellectually sounds in the ears of God. Mais la fête est finie, la foule se disperse, et l’Aria revient, comme de loin. Plutôt que de l’énoncer affirmativement, comme au début, mieux vaudrait la rendre voilée et, rétrospectivement, plus belle encore. Ce moment, certainement l’un des plus émouvants de toute la musique, nous parle avec une grande simplicité. Notre voyage est achevé, mais nous revenons là où nous l’avons entrepris. Elle recèle une sorte de divinité, plus que ce que l’oreille ne découvre. Elle est une leçon hiéroglyphique et voilée de l’univers tout entier et des créatures de Dieu; semblable mélodie à l’oreille, comme l’univers tout entier, bien compris, offrirait la compréhension. Bref, elle est un mouvement sensible de cette harmonie qui résonne intellectuellement aux oreilles de Dieu. Aber nun ist das Fest vorbei, die Menge zerstreut sich, und wie von fern kehrt die Aria zurück. Statt sie affirmativ darzubieten, wie sie am Anfang erscheint, sollte sie nun verhangen und im Rückblick noch schöner wirken. Dies ist sicherlich einer der bewegendsten Sätze der Musikgeschichte, und er spricht uns in aller Schlichtheit an. Unsere Reise ist abgeschlossen, doch wir sind an den Ausgangspunkt zurückgekehrt. Es enthält mehr vom Göttlichen, als das Ohr zu entdecken vermag. Es ist eine hieroglyphische, umschattete Lektion über die ganze Welt und die Geschöpfe Gottes; solch eine Melodie fürs Ohr, wie sie die ganze wohlverstandene Welt den Verständigen zukommen ließe. Kurz gesagt, es ist ein sinnreiches Maß jener Harmonie, die geistvoll erklingt in den Ohren Gottes.